This entry was posted on Wednesday, October 7th, 2015 at 5:51 pm	and is filed under Biology & Culture, History, Science Fiction & Fantasy, Writing & Literature. You can follow any responses to this entry through the RSS 2.0 feed. Both comments and pings are currently closed. I had never thought of the Dwarves in this way. They definitely have gotten “short shrift” versus Elves in Tolkien–and in a lot of Tolkien derivatives. As you say, Paul. Tolkien’s Dwarves are just a filler: he could easily have omitted them with nary a ripple. Jackson had to make them interesting, for the sake of his projected epic. Hence the resonances I discuss here. They come across unmistakably as Mediterranean stock. I agree, about Tolkien & Jackson and everything. I really loved Jackson’s LotR, and rewatched it many times. I could barely get through TH the first time. By padding TH, he took a cheerful if slight children’s tale and turned it into a soulless amusement ride. Here’s the contrast: the vast majority of the scenes and shots in LotR were of narrative necessity. Jackson’s TH, by contrast, was stuffed full of shots which existed only because “it looks cool.” One example is in the last movie where Legolas on the crumbling bridge runs from stone to stone. Furthermore, in LotR, the attitude towards violence is one of sorrow and grim necessity, reflecting Tolkien’s own experience and losses in the first world war. In Jackson’s TH, violence and death becomes a vehicle for slapstick comedy. I don’t believe in overly literal translations of books to film, and indeed sometimes re-imagining a book can provide a commentary (an imperfect example is Paul Verhoeven’s Starship Troopers) but Jackson’s TH is such a violation of the spirit of Tolkien, for no good reason besides empty humor, that I was repelled by it. I will say: you’ve made the dwarves more interesting than they came across on the screen to me. The conclusion that Jackson reverted to schlockmeister mode for The Hobbit is inescapable. 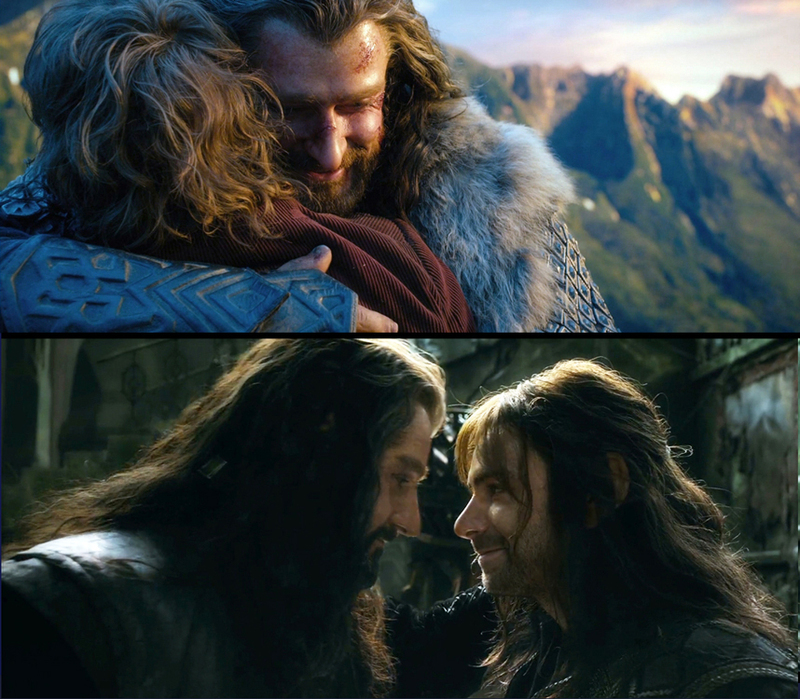 When I heard Jackson’s grandiose plans for TH and then saw how he had decided to present Thorin and his nephews, I knew that my brain and solar plexus would part ways because their correspondence to my ancestral memories was immediately visible. Even so, I ended up seeing The Hobbit trilogy on transatlantic flights with my finger firmly on the Fast Forward button. I mostly agree with you about the violence in Jackson’s LotR versus TH. At the same time, both Tolkien and Jackson made the villains so relentlessly monochromatic that there are no moral qualms about exterminating them as vermin (plus they end up being boring smudges). 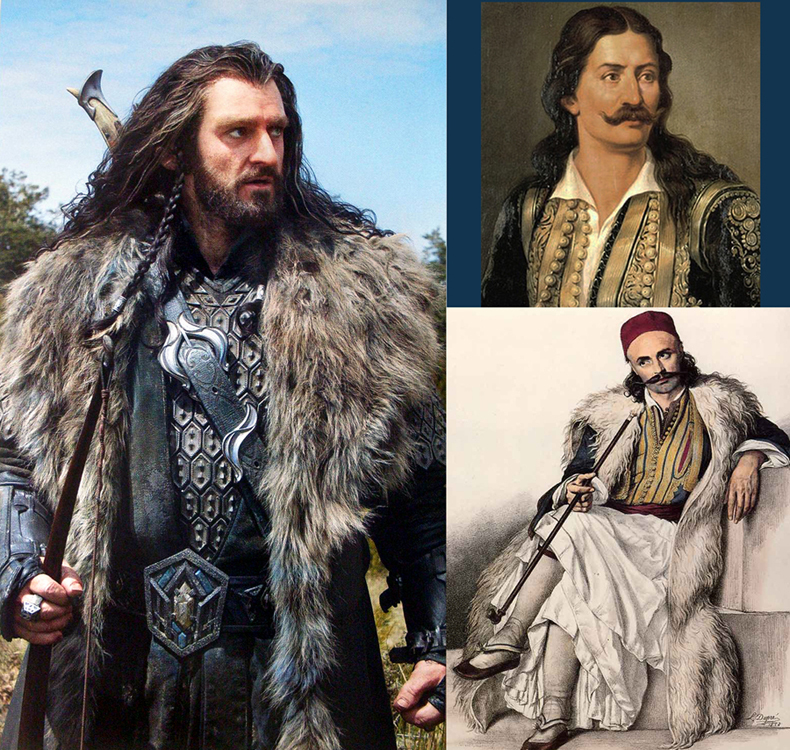 Conversely, Jackson’s Thorin shares the dilemmas that make Boromir and Aragorn moving. But as with all else in TH, Jackson stretched his redemption arc to exhausting, diminishing-returns length. I’m still grateful for Jackson’s LotR. As for The Hobbit, what he should do is give us not extended versions, but condensed ones. I’d pay for those. curious, then, that in the Lhammas and related works Tolkien credits Khuzdul as being a significant influence on the ancestral Mannish languages, and indeed Adûnaic looks (and presumably sounds) as much like Khuzdul as like Eldarin. Dwarvish also seems to share phonological aspects of the little-known language of the Valar. “The tongues and voices of the Valar are great and stern, and yet also swift and subtle in movement, making sounds that we find hard to counterfeit; and their words are mostly long and rapid, like the glitter of swords, like the rush of leaves in a great wind or the fall of stones in the mountains.” says an Elvish sage. Presumably Khuzdul, if it was devised by Aulë, would have borrowed something from the speech of the Valar. As indeed would the Black Speech, devised by Morgoth for the Orcs. Not, perhaps, very congenial to Elvish ears and tongues (or to the author’s), but still, Galadriel managed not to choke on it when she recited those sacred Dwarvish place names to Gimli. I do know of the shared script. However, the sharing would not extend to the language sounds; see Turkish use of Arabic script, Japanese use of Chinese ideograms or, for that matter, Mycenaean use of Minoan script (if the two languages shared sounds, we would have deciphered Linear A and would know what Minoan sounded like and, possibly, what it said). I don’t think the language division is goodies/baddies. It’s Tolkien invested/not-invested. As it stands, we have far more Black Speech than Khuzdul in the works Tolkien published (that is, before his estate decided to put forth drafts). Overall, Tolkien’s Dwarves are too sketchy to ping my interest meter — my focus here is on the connections that Jackson’s take elicited.